Hi Marko. About your answer of jan 26: "
Sync will sync files between your devices either within your local network, or via the internet. However, in order to sync those devices must be turned on. 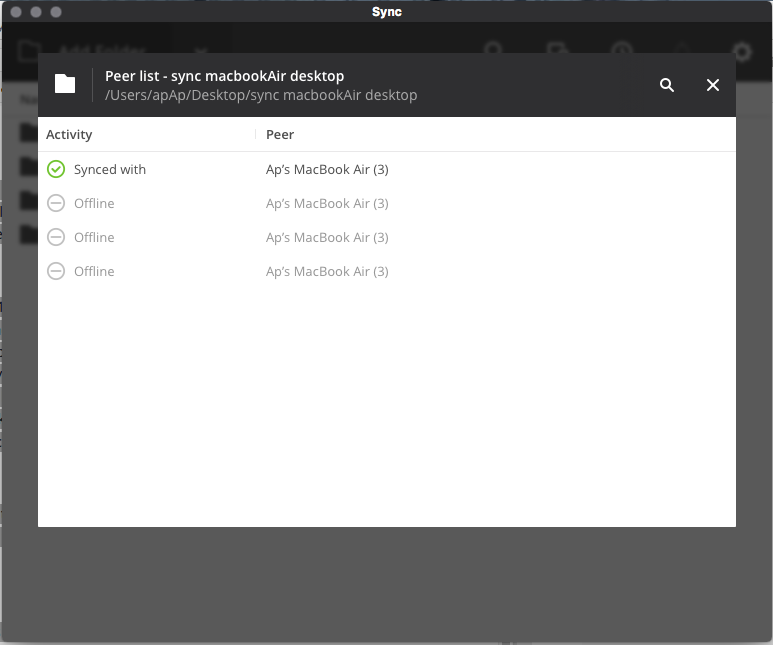 Sync itself isn't "remote access" software - i.e. 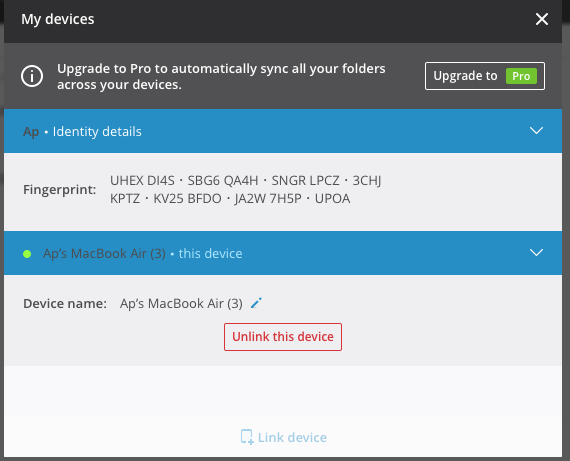 you won't be able to retrieve a random file from a remote device, you'll only be able to access files within folders you've specifically set to sync." On Macs, does this mean that the machines I am syncing with must appear in the sidebar as "shared" devices before sync will function remotely? Or, should sync work after the key is entered, to any machine connected to the internet? As I read, BTS is not remote access, right? I'm using mac, el capitan 10.11, and changed from one laptop to 4 machines (to 2 macBook Air 2012, and 2 desktops, iMac and a mini I built) so I could stop depending on manual backup and a primary laptop that was failing, and so I would not have to carry a laptop from location A to location B all the time. So I am trying to keep 4 or 5 folders the same over 4 machines. I used links to setup sync on all the machines first manually. I set them all in location A first, everything synced fine. Then carried one laptop and one desktop to location B. Nothing syncs remotely. I thought I should be able to take the laptops anywhere and designated files would be synced; not have to re-link every time i reconnect a laptop wirelessly. I could not be in both locations at the same time. A) I'm not at both locations at the same time to set this up! I'm at one, and no one is at the other location. Is this a problem? I leave the computers on and connected to power and on amphetamine so as not to sleep! didn't seem to work. should drives and or computers not be allowed to sleep? B) My identities on at least 2 machines here have different fingerprints. I read that that is not supposed to happen. Same user same identity on all machines is supposed to happen. see image1. fingerprint is different on laptop.